The answer is probably in your last question. The Indus Civilization probably had no natural enemies. The region was separated from the towns of eastern Iran by the mountains of Indo-Iranian borderlands, still inhabited by people descended from the ancestors of the Indus people, with whom they had an integrated, mutually beneficial relationship, people from the highlands bringing their animals to the plains for winter pasture. Regions to the east and south were not densely populated and the Harappans offered a market for their products (such as copper from the Aravallis) in exchange for attractive manufactured goods or exotic materials, so the people of these regions had more to gain by peaceful cooperation than by attacking the Harappans. Similarly the nearest people by sea, the inhabitants of Oman, had much to gain by peaceful interaction and were too few to pose a threat, while the Mesopotamians, experienced in warfare, were too far away to make conquest feasible, even if they considered it (there is no evidence that Mesopotamians actually came to the Indus – they seem to have sailed no further south than the western shores of the Oman peninsula). Conversely, the vast Indus region was not sufficiently heavily populated for there to be any pressure to expand into neighbouring regions, so no incentive for the Harappans to attack their neighbours. However, no society can operate without a means of controlling violence by individuals and in a region where wild animals abound, defence against animals is necessary. So it is entirely to be expected that Harappan villagers had weapons to protect themselves against wild animals (and to hunt them for food and materials such as leather) and highly likely that the Harappans had some form of armed police to protect the public and deal with criminals. It is true that Harappan art does not portrait warfare. It is also true that no good weapons like spears or swords have been found. There is also no evidence of sacking or burning of Indus cities. The inescapable conclusion is that the Harappan were a peace loving people not given to war or aggression. The civilisation seems to have declined and collapsed due to natural causes and also probably due to the failure of the ideology which bound the Harappan people together. The clay balls you are referring to are missiles used by the defenders of forts. They would be aimed at the besieging forces manually or by slings. These clay balls have been found at many Harappan sites. I would call them defensive weapons. The current Radio 4 series, which I have not heard, if what you say is true, is perpetuating myths about the Indus Civilization that scholars are working hard to explode. There has never been a society without conflict of greater or lesser scale. Previously it was thought that the Maya Civilization and the peoples of the American Southwest were entirely peaceful. In both cases, because the glyphs were deciphered in the first case and because archaeological and bio-archaeological studies proved otherwise in the second case, we now know that this idea of peaceful societies for those two instances is without foundation. As noted, for the Indus, we lack much of what might give us direct evidence of conflict or warfare such as graphic iconography and a readable script. Until recently, standing armies of any size did not really exist; warfare was seasonal and often based on raiding at a greater or lesser scale. Some of the most successful "warfare" has been carried out by very mobile horse mounted groups, e.g. the Comanches of the historical American SW and the Mongols of Central Asia, but horses were not used widely in the Near East, South Asia, or East Asia until after ca. 1900 BC. Conflict was much more likely to be local, with periodic raiding of particular concern along with local conflict over rights to water or to land or to other resources. The first empire based on conquest is thought to be the Akkadian empire of Mesopotamia ca. 2350-2200 BC, and the Akkadians had little problem with the walled cities of the region, so walls are not really an issue. What the political structure of the Indus Civilization was is unknown and perhaps unknowable because what we know about that structure in Mesopotamia and in Egypt and in China is largely from the texts. 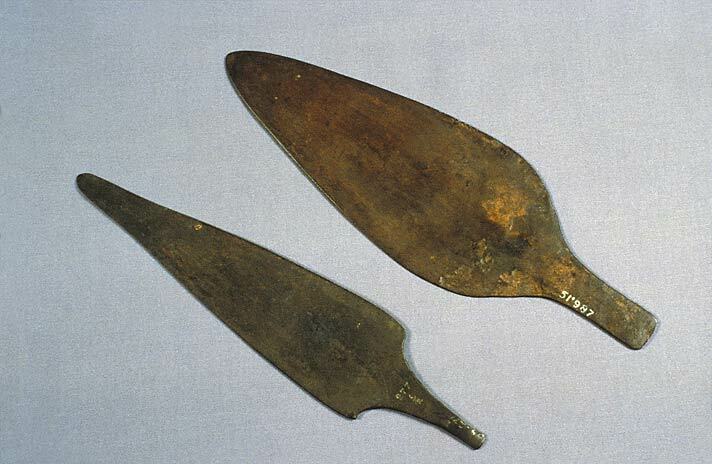 The Indus people certainly did have serviceable weapons of copper-alloy materials including knives, spears, and arrow heads (many have been found) and there are depictions, for example, of a man spearing a water buffalo so the concept of attacking with a spear is certainly present. And organization is certainly as important as technology – Alexander of Macedon, Napoleon, Ghengis Khan, etc., all showed that. This cliché will survive for long, I’m afraid. As it did with the Minoans. I gave a public lecture on this in Delhi in February 2009. Except for JP Joshi’s report on Surkotada, and his careful count of the sling balls, no recent excavator thinks along the lines of warfare. The layers of ash and debris over some Early Indus settlement remains are conveniently ignored! Do remember that in ancient and medieval history too, Indian rulers are rarely, themselves, shown at war—the deities may be depicted vanquishing mythological enemies, that is different. I suspect the transition from Early to Mature Harappan period did not take place without violence. Warriors spearing each other are represented in Harappan style on a BMAC-type cylinder seal from Kalibangan, accompanied by a tiger-riding goddess that seems to be a predecessor of the later Hindu goddess of war and victory, Durga. Cf. Deciphering the Indus script (1994), p. 23-24, and my paper in Zinbun (Kyoto) vol. 34 (1999). Many even very small Harappan sites in Gujarat such as Kanmer are heavily fortified.